The third release from heavy Latin funk outfit, Brownout dropped a couple of weeks ago and has since filled a welcomed space in my Latin funk collection. 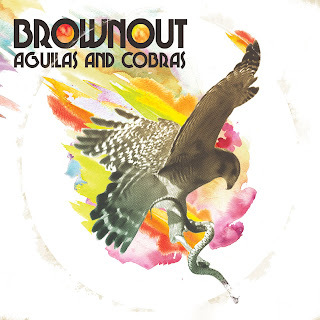 Hailing from Austin, Texas, and co-lead by the ubiquitous Adrian Quesada (Groupo Fantasma, Ocote Soul Sounds), Brownout’s members have toured with and played for Prince (under Groupo Fantasma), so needless to say, they have mad chops in the instrumentation department. Complete with fuzzy guitars, blaring horns, banging keys, solid percussion, and breaks galore, Aguilas and Cobras combines the best of Latino funk, rock, psychedelia, and soul, while nodding frequently to the roots of African rhythms. Sonically, the recording sounds like a long lost reel of Santana meets Chakachas, meets The Meters, circa 1972-1976, yielding a soundtrack feel throughout the listen. What I dig most about this album is that it would have sounded just as good if it were released in the 70’s, when most of the group members were a mere glimmer in their parent’s eyes. Con el Cuete – The hypnotic mid-tempo rhythm and keyboard work makes this a nice one to get the night started. Tell Her She’s Lovely – Refreshing early set track, nice title and lyrics. Brother Carlos Santana would be proud of this one. Olvidalo – Opening breakbeat, acoustic guitar rhythm, and call and response makes this a favorite. Definitely for the b-boys and girls. S.F.L.A. Con el Cuete Reprise – I can already hear cats chopping this one up on the MPs. This one sounds like the drive home at 5:30 am just before sunrise.